Why should the service be trusted? 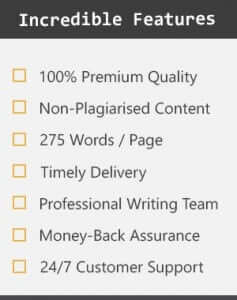 We are a writing assistance company that has been catering to the academic needs of the students for more than a decade. Our services extend to every corner of the world, and have maintained our name in the industry due to our diligence and professionalism. We do not make false claims and let our quality work do the talking. Hire us and experience the services on your own. When would it be convenient to contact the service? Our customer care panel is available round the clock and can be contacted as and when needed. Contact them via email, chat or the landline number provided on the website. How qualified are the writers of this company? Our company only hires such individuals who have a Master’s or PhD degree to their name. Along with that, prior work experience is also a requisite at the time of hiring, for we prefer to provide professionally sound writers to our clients. A careful assessment of the writer’s previous qualification and work experience is done by the HR department before hiring. If the services are hired, is there any guarantee of an A grade? We strive for perfection in providing all the services required by the client, but never claim a guaranteed A grade as the final grade depends solely on the client’s own performance during the classes and exams. What can be done if the final draft received is not satisfactory? We provide the facility of a free revision if the client is not satisfied with the final draft. Also, a money back guarantee is there to ensure that if the client is not fully satisfied with a revision, he/she may ask for a refund. For more information on that, refer to the section on the Refund Policy. How does the company ensure a plagiarism free content? A strong plagiarism detecting software is used by the QED to check all the orders before being sent to the client for any traces of copied content. The report generated by the software is also sent to the client on request. Are there any offers or coupons offered by the company? Yes, we provide annual as well as other sales and discounts from time to time. 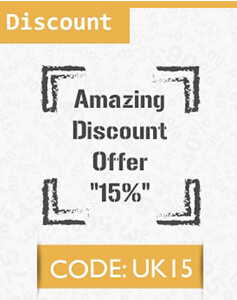 Refer to the main page for the current offers. Can the same writer be hired again by us if we are satisfied with his style of writing? Yes, it is certainly possible when you mention it in the order requirement form and the same writer will be assigned to work on your order.